It is Ron Ross’ contention that wherever you turn in this world there is a story—and he would like to tell as many of them as possible. Yet Ron took a most circuitous path to realize his dream of being a writer/storyteller. Growing up in the East Flatbush section of Brooklyn, a predominantly Jewish neighborhood with a pocket of Irish, has greatly influenced his fiction works, where it’s eccentricity has left such a mark on Ron that it became the background of many of his stories. Ron was only seven or eight when he received his first boxing lesson from his Uncle Dave, a former boxer. Between Uncle Dave and highly regarded prizefighter/cousin Irwin Kaye Kaplan, Ron was, perhaps unwittingly, drawn to the world of boxing. Ron spent much of his childhood and young adult life boxing, starting out in his basement being coached by his uncle, to eventually making it to the professional ring. Between earning his B.A in English at Brooklyn College and his Masters Degree at New York University, Ron served a two-year hitch in the army. Ron was stationed in Austria and Germany and wound up in Special Service on track and boxing teams. Despite his love of boxing, his most memorable assignment was “off-season” as a Train Commander in charge of a military train for VIP's that traveled between Linz, Austria and Livorno, Italy. Not a man to throw away his passions, Ron was involved in the boxing world—first as boxer, then as a manager and promoter, all while running a successful real estate business for nearly forty years. Throughout all the years in the business and sports worlds, he continued to nurture his true love—writing. However, it wasn’t until he closed his Real Estate office in 1992, that he was free to fully focus his bubbling creative energy on writing. For nearly his entire life, Ron wrote. From quirky poems to engaging short stories, Ron would simply write whenever he could and then put the work on a shelf. After fifty years of writing, Ron decided to pursue it professionally. Ron was first published in 1993 with the release of his witty fiction novel The Tomato Can, and has continued to come out with numerous powerful works since, including Bummy Davis vs. Murder, Inc. (2003), Nine...Ten...and Out!, The Two Worlds of Emile Griffith (2008) and Tales from the Sidewalks of New York (2012). Ron also was involved in and took part in the feature length documentary Ring of Fire; The Emile Griffith Story, based on his book. In 2007, Ron Ross surprised many by publishing two children’s books, Mcgurk and Me and Willie The Quiet Turtle. To his children and grandchildren, who had grown up hearing wondrous bedtime stories of colorful lands and playful animals, the step away from more mature topics such as mob violence was more than natural. In fact, the two books were written six decades prior to their release while Ron was a student at Brooklyn College. Publishers Weekly has described Ron as “...a writer with the flair and spellbinding magnetism of a natural storyteller,” and this holds true regardless of genre or intended audience. The books were illustrated by youngsters in an art program at the Friedberg JCC in Oceanside, where Ron is a member of the Hall of Fame. Ron also remains active as a member of the Boxing Writers Association of America and writes numerous boxing articles as well as covering major fights around the country. Ron Ross was inducted into the Long Island Jewish Hall of Fame in 2007 and the Florida Boxing Hall of Fame in 2012. A native New Yorker, Ron and his wife Susan now share their time between Oceanside, NY and Boca Raton, Florida. ROSS JOINS INDUCTEES INTO FLORIDA HALL OF FAME. Longtime Oceanside resident Ron Ross was inducted into the Florida Boxing Hall of Fame June 22-24th at the Wyndham Hotel in Tampa, Florida. This honor comes just three weeks after the honor he received for his book Bummy Davis vs Murder, Inc being the catalyst for Al “Bummy” Davis being inducted in the National Jewish Sports Hall of Fame in Commack, NY, as one of boxing’s all-time greats. Roberto Duran, one of the All Time Greats. He was the first fighter to defeat Ray Leonard. Roberto was named “The greatest Lightweight of the 20th Century,” by the Associated Press in 1989 and was inducted into the International Boxing Hall of Fame in 2007. Danny Nardico was a world ranked middleweight from Tampa, who is credited with being the only fighter to legitimately knock down the great Jake LaMotta. His overall record was 50 wins (35 by K.O. ), 13 losses and 4 draws. He was also a U.S. Marine who won the Silver Star for valor and two Purple Hearts while in Okinawa during World War II. Chico Vejar; won 93 of 117 pro bouts, losing 20 and fighting four draws. He fought 11 times at Madison Square Garden and appeared frequently on nationally televised fights against the best fighters of his day. He appeared in two movies in the 1950’s that starred Tony Curtis and Audie Murphy. 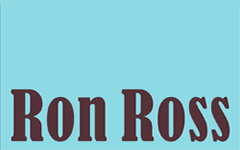 Ron Ross: was himself a professional boxer, a fight promoter, and a manager. He is a member of the Boxing Writers Association of America and writes numerous boxing articles as well as covering major fights around the country. He has written three very successful books including the widely acclaimed Bummy Davis vs. Murder, Inc. He divides his time between Oceanside, New York and Boca Raton, Florida. Ron Ross was inducted into the Long Island Jewish Hall of Fame on May 21, 2006. 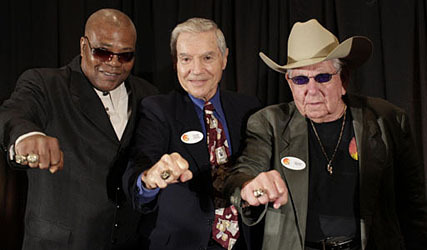 Mark Conn: was one of the great referees of the “Sweet Science.” His professional boxing referee career in the State of New York was from 1943-1973 and he was a professional boxing judge in the State of Florida from 1987-2000. He was the first referee who was credited with waving his hands over a fighter to signal the end of his ten count, because he thought that no one was actually able to hear the count anyway with the crowd noise.